Thank You Gilford High School for organizing an UGLY SWEATER fundraiser the day before the holiday break! They raised $43 for Gilford Got Lunch! Thanks for supporting our program in a fun and festive way! 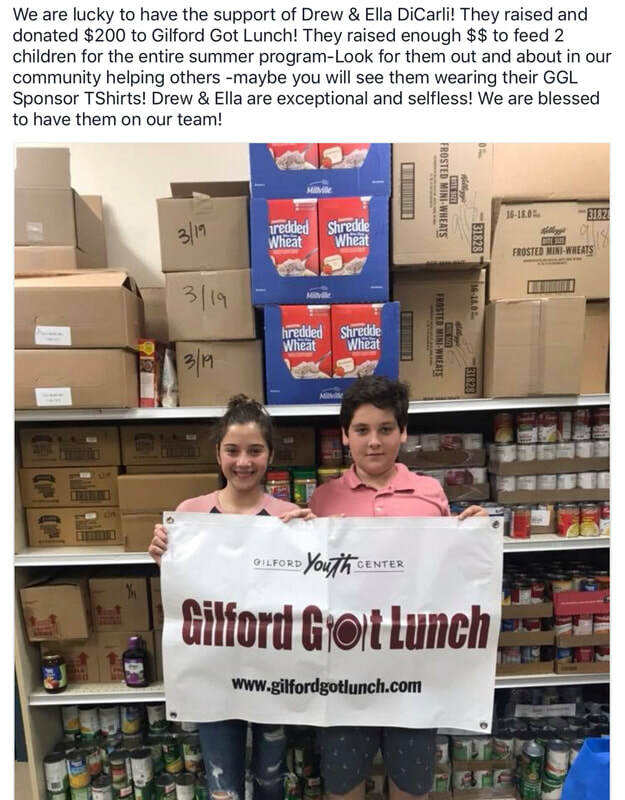 Thank you Gilford Elementary School for your ambitious food drive to benefit Gilford Got Lunch this Holiday Season!!! 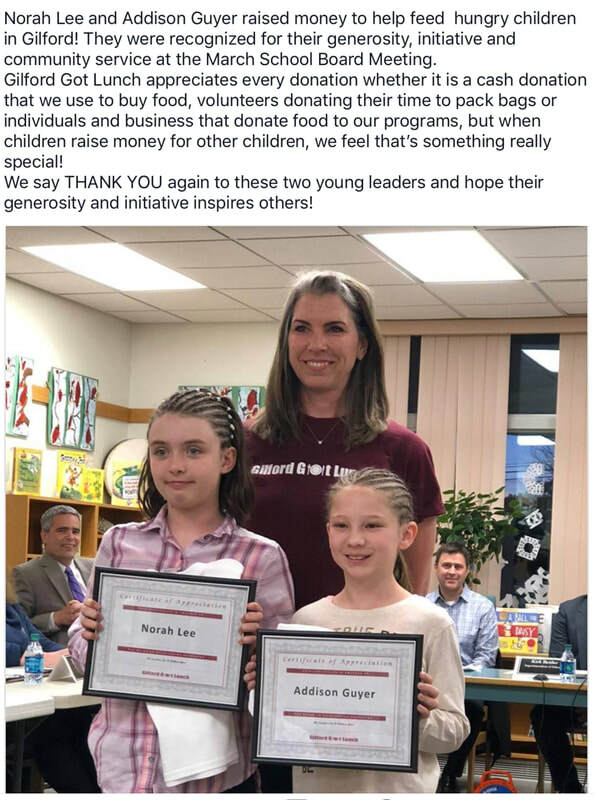 Gilford Got Lunch would like to say THANK YOU to Cooper Products Inc. (located in Laconia, NH) for their generous support to our summer and school lunch programs. Their recent donation will allow us to continue to offer support and assistance to the children in our community. for their generous support of Gilford Got Lunch! 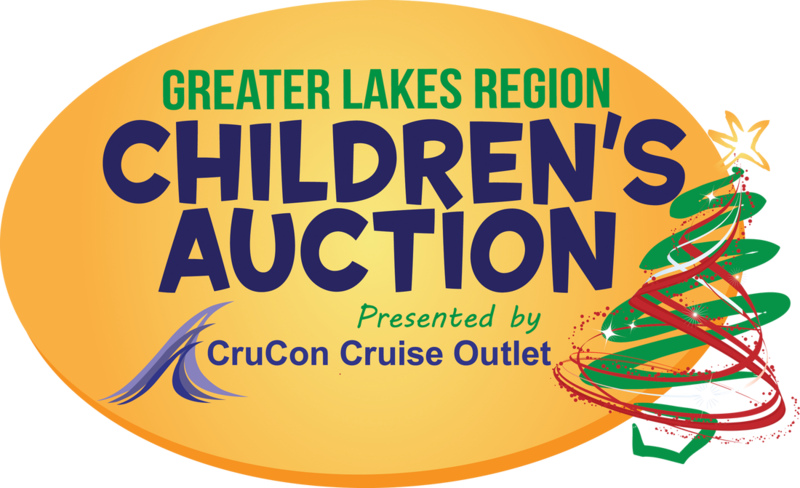 $2500.00 will go a very long way toward feeding the children in our community! 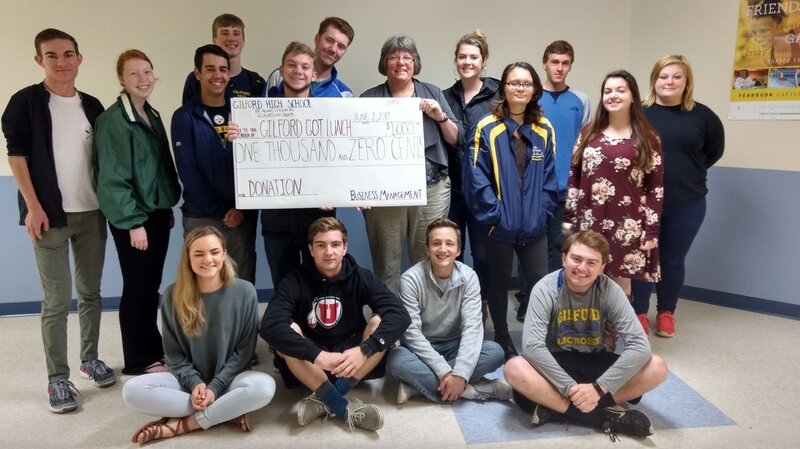 Gilford High School students from Steve O'Riordans business management II class raised and donated $1000 through their Steve O Subs class project! We are very grateful to all the community members that supported this class with their lunch purchases. These funds will help GGL provide healthy lunches to many children this summer THANK YOU! THANK YOU to all that donated food items and cash at our Election Day Food Drive! We collected alot of food and cash donations despite the snow and we are very grateful for your support! ​We distributed new toothbrushes and toothpaste to every registered child in our School Program last week. We hope the children are practicing healthy dental cleaning twice daily! These supplies were generously donated to GGL again this year from Winnisquam Dental (Tilton, NH)! Thank you again to Dr. Derek Blackwelder & Dr. Kristine Blackwelder of Winnisquam Dental! 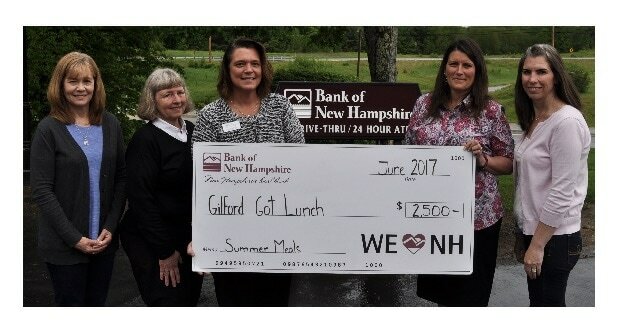 ​Yes - The New England Patriots scored the Super Bowl win this year but a week later, the Gilford Community Church scored an outstanding win for GILFORD GOT LUNCH with their First Annual “SOUP-ER BOWL”. Scott Hodsdon, Director of the Gilford Youth Center, challenged the congregation to bring in cans of soups which would be collected the following Sunday. A total of 215 cans were collected and the winner was GILFORD GOT LUNCH! Thanks to the generous donation from the church members the cans of soups will provide 215 meals for children in the program. The 8th grade students of Gilford Middle School recently donated $186.25 to Gilford Got Lunch. The class participated in a program called The Trout Project. 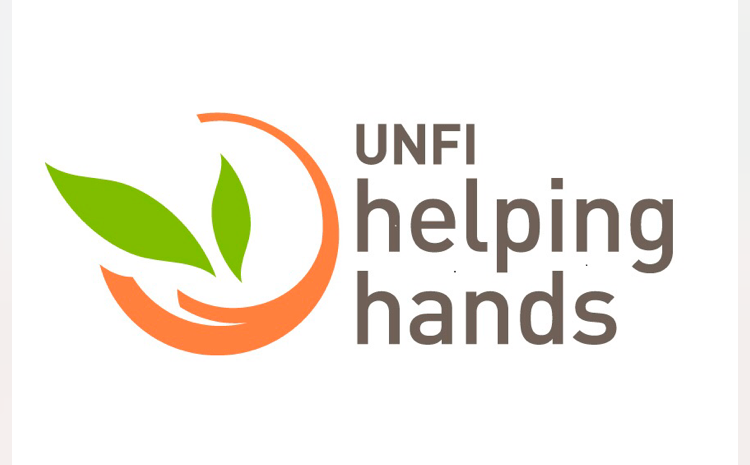 This project involves the students coming up with a business plan and a product to sell. This year the students made, marketed, and sold cookies and dog biscuits. They decided that the funds raised should go to Gilford Got Lunch Program. These funds will feed more than one child for the entire summer. We would like to say a belated THANK YOU to these students and GMS staff for their generous community support. Gilford High School students from Steve O'Riordans business class raised and donated $1300 to GGL! We are very THANKFUL for their generosity! The students of Gilford Elementary School have completed another successful can drive for Gilford Got Lunch! Pictured here are a few of the amazing and generous students and the cans they collected. The students at GES collected and donated 870 cans of fruits and veggies for our Summer Program. And they didn't stop at 870- the EarlyAct club has generously made a cash donation to purchase the 130 additional cans to make the final count 1000 cans!! Great job GES students!! THANK YOU! The Gilford Middle School 6th grade class recently donated to GGL. They collected food items and also presented a check for $110.00. 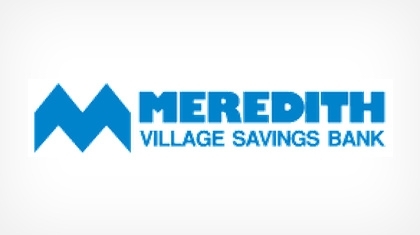 Their cash donation alone will feed one child all summer long! We want to send out a Thank you to GMS for the great support! 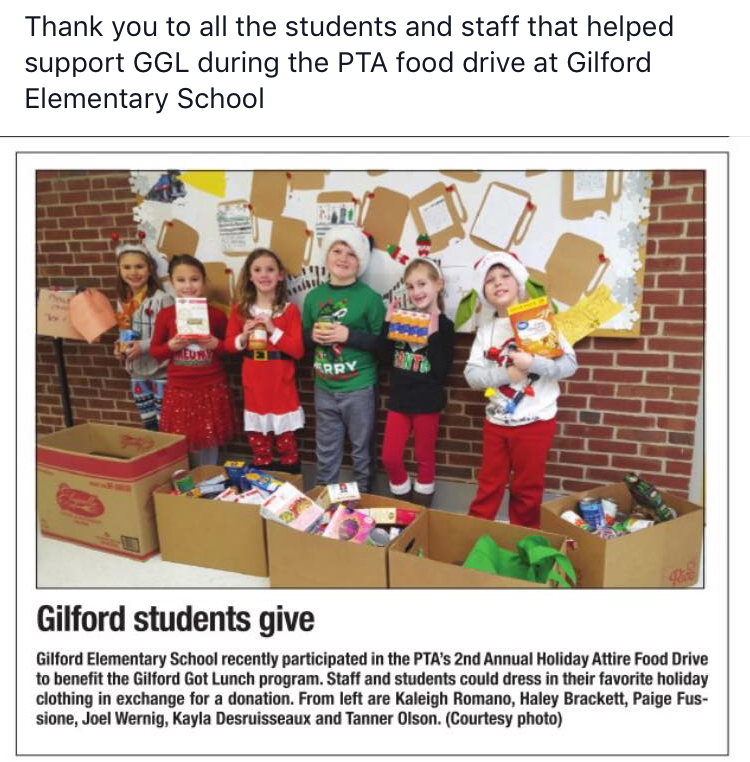 The Gilford High School students recently completed a food drive for GGL. We are so grateful for their support and will be distributing their collections for our week-end program starting this week. Again, we say THANK YOU GHS for the great support!